Would you be better off with a moderately sized film cap rather than a large electrolytic? Have you had a look at the output on a scope? I did almost exactly the same with my pic based nixie clock – I found that it was very easy to generate a high voltage, but required a bit of tweaking to stop the voltage swinging – although mine was purely proportional – and the rough output was perfectly fine for some nixie tubes! Yes I agree with you John a smaller cap may be used, and would be recommended for a permanent installment. That being said, I would redo most parts if it was for permanent installment. These just happen to be the parts that I have laying around. I found that with very small loads or larger loads the system can be finicky. You can get complete boost switchers in an SOT-23 or SO-8 package from Linear. If you need just to make a fixed voltage it is easier to just stick one of those in. If you want to control the voltage a resistor from the PWM of the micro to the feedback network works nicely. You fool the chip into thinking it has a higher output voltage that it really does by pulsing the pin high. This make the control number backwards to the normal but people usually get over that quickly. Great Idea. Yes there are great boost converters available. Sparkfun has one, and maxim makes a few. Maxim offers free samples for educational and business use. I will add that to the post. I highly recommend you look output signal with oscilloscope. You will see a lot of pulses (witch you can get rid off with film capacitor in output). Also is good to look at mosfet’s source current – witch must be like ramp. So, the max output will be 100. But is that 100% duty cycle or is that 100/255 (~39% duty cycle). Not sure how it’s scaled, but I’m used to setting duty cycle with analogWrite(). 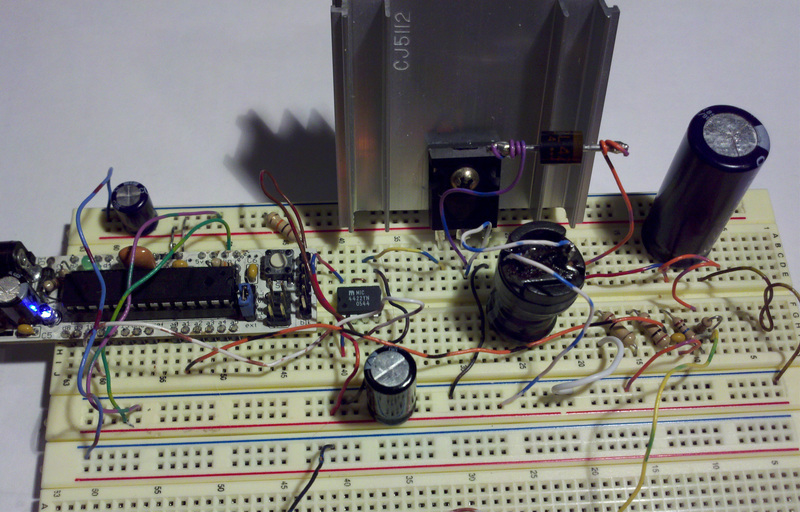 Pingback: PID Tuning Parameters for a boost converter. Can anybody tell me the procedure for simulation of Digital PID Controller for Buck Boost converter in SimuLink. Please explain with its all parameter values. kindly send replis to my mail which is ragavan.cmv@gmail.com. Hi, can this work with a variable input that goes form 5-18V to give a constant output voltage of 80V? If I just change the configuration/arrangement of the same components into a buck converter configuration, will it work? 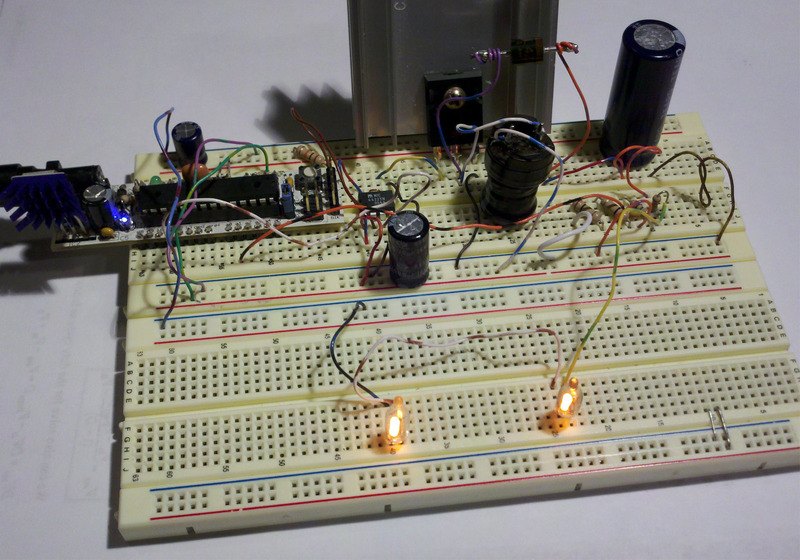 Yes I was testing some high power LEDS by just making a buck converter with arduino. 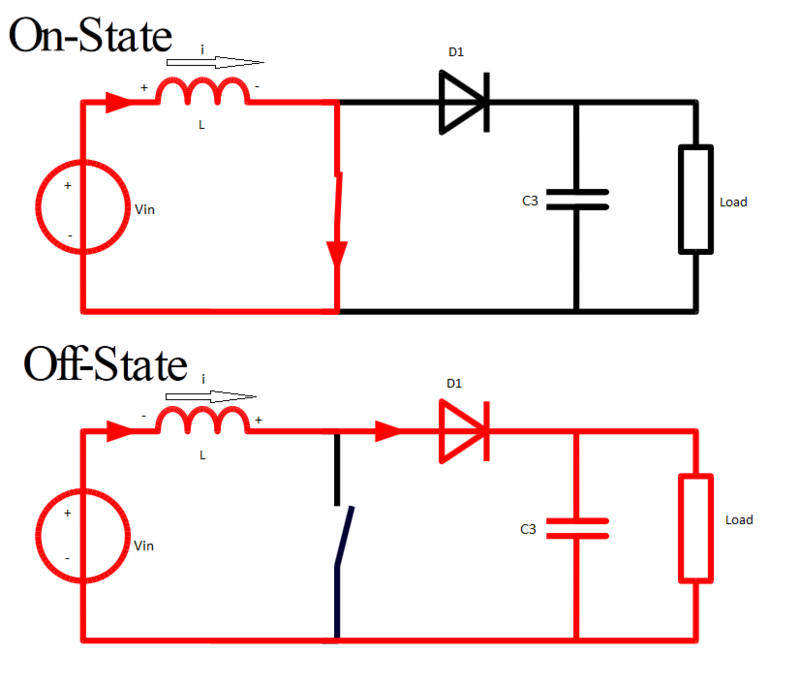 If you look at the image above, the mosfet would have its source connected to the positive voltage rail. So use a P channel mosfet. Experiment with it before you connect any real loads. Have it shut off if the analog feedback is above 1023. I’d also check the output with an oscilloscope too!. You can use an N channel fet, but you’ll need a bit more of a complicated mosfet driver. Are you sure you installed the library correctly? if so, use arduino version 0022 with the pid library beta. It’ll get less efficient as your input to output ratio increases. If you need a high voltage output from a low voltage source use a transformer. could it work in buck-boost converter? i mean for simple code?..thanks.. how can i control the duty cycle (close loop) with very simple pwm? any idea? Yeah that will work. Just get the attinys pwm frequency in the 10kHz to 100kHz. Read the details on all the application notes on my site. but how about current control and voltage control run together. Is it possible? If I were to have a variable input (45v-75v) and needed a steady 100v output how exactly would I do this? I also need to run the circuit at 200kHz pwm. I appreciate the help. you’ll need a boost chip if you need 200KHz. Arduino max is ~68 or so KHz – it might be ~31.2KHz. I would use a voltage divider to divide 100v into 4v and do a proportional controller on the boost circuit — if i used an arduino. Hi, here in Brazil I only found the IR2101 mosfet driver. Do you think this chip could be used instead the mic4422? I’d like to make a ramp from 0V, or almost, to 250Vcc with 150mA, do you think that is possible? Hello, i’m try to make my own boost but i have some problems. I think that the inductor is the cause of all that. The main problem is that he actually works as buck, crazy. I used home made inductor, with ferrite’s core. 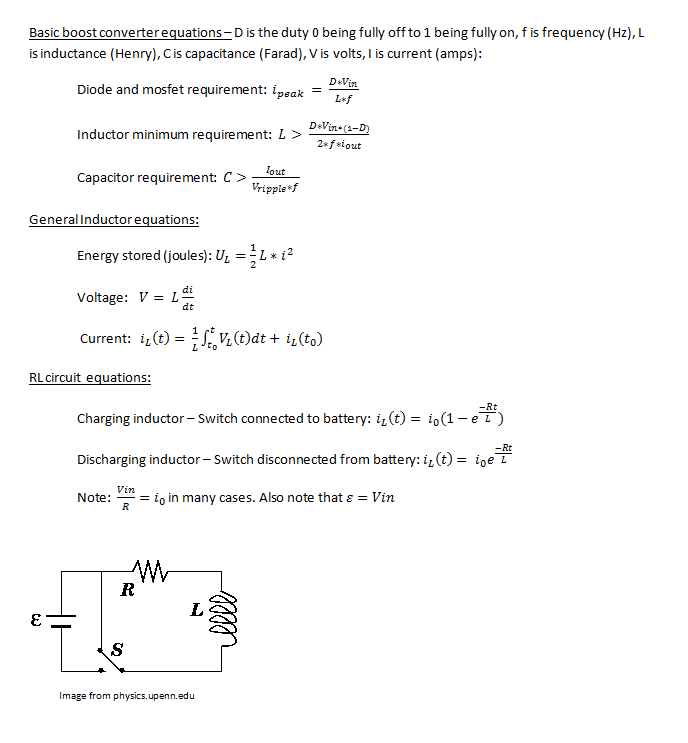 I think that what happen is that my inductor can’t stores 1/2LI^2 energy, cause the permeability is too much high. Do you think that this could be the reason? Should the inductor be with air or with out? Should the inductor be able to store that energy? excuse me, I want to ask you something about “how to change the frequency from 31250 Hz to around 50000 Hz or anything else that we can change the frequency”. please how ? i wanna ask you about this post. i have made a BUCK-BOOST converter for charging battery with solar cell using arduino uno. but i have a problem with my program. my program it’s doesn’t work. Im using a similar design to make a 4-quadrant chopper prototype. I use the same gate driver. Is there any reason that during operation the input voltage to the gate driver would be shorted to the input of the converter? This seems to be happening to me when I use the converter, but when it’s turned off they are not shorted. Hi there,I log on to your blogs named “Boost Converter Intro with Arduino | ReiBot.org” on a regular basis.Your humoristic style is awesome, keep up the good work! And you can look our website about تحميل اغانى.